This POPular snack is sure to generate interest in your promotion. Put your logo on their favorite snack for a heaping helping of brand recognition. The white microwave popcorn bag (3.5 oz.) 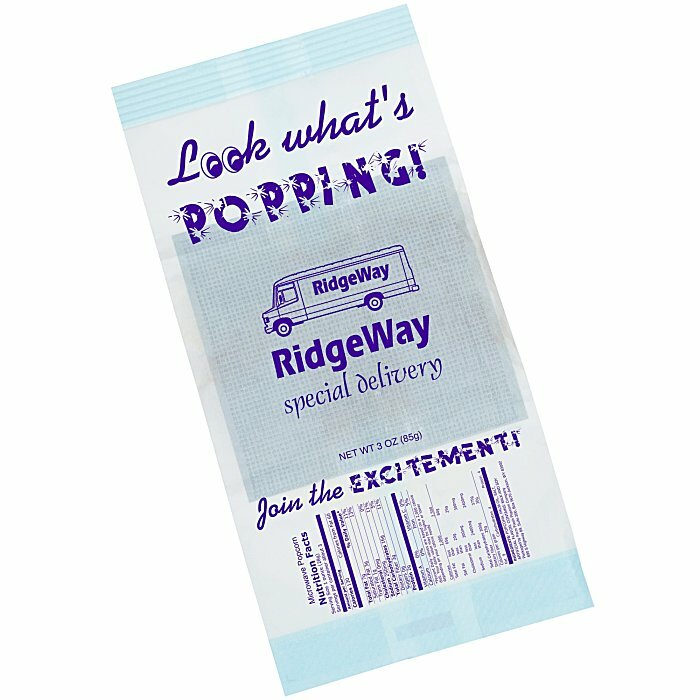 includes a stock design featuring “Look What’s Popping” and “Join the Excitement” on the top. Size, folded: 4" x 5-5/8". For other logo’d microwave popcorn designs, see the following items: #100194-BAMicrowave Popcorn - Business Appreciation (Business Appreciation); #100194-PPMicrowave Popcorn - Popcorn Popping (Popcorn Popping); or #100194-PTMicrowave Popcorn - Popcorn Tub (Popcorn Tub). Your price includes a one-color imprint on the front of the bag (includes your logo and the stock design). If you would like the stock design to be a different color than your logo imprint, please indicate the color in the additional comments box during the ordering process; an additional color run charge will apply. Set-up charge: add $65 per color.